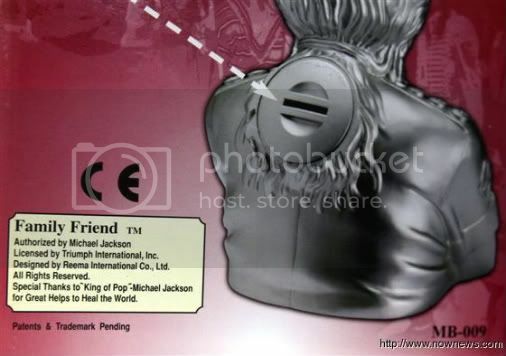 Michael had issued Mrs. Ma the rights for the MJ Money bank trade mark 'Family Friend', designed by Ma's company 'Reema International' and licensed by Michael company 'Triumph International Inc'. The phases 'All for one = One for all', 'All for World = World for all' on the packaging was Michael's concept of an ideal world of an universal mutual love for all. 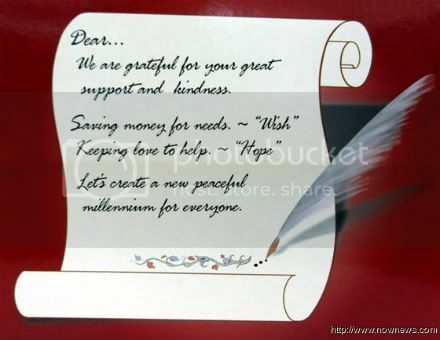 After inserting the first coin, you will hear Michael's message:" I love you very much! ", when inserting the second coin, wait for the first coin to drop, you will then hear "Let us all heal the world!" 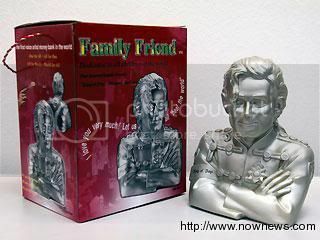 More information can be found in the photos below, which show the packaging of MJ money bank. The background also shows images of Michael and the twins on the History tour in Durban, South Africa.